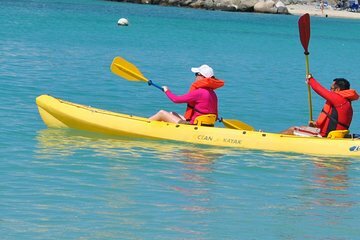 Kayak and snorkel in St Maarten's Simpson Bay during a leisurely, 2.5-hour eco-adventure. This slow-paced excursion is a suitable option for beginner snorkelers and kayakers. Follow your adventure guide on 45 minutes of snorkeling and 40 minutes of kayaking, with plenty of breaks and instruction. Get a clear view of the island's underwater environment, including live coral and species such as parrot fish, trumpet fish and tang. Finish up with a refreshment at a beachside restaurant and a group discussion of the marine life you witnessed. Use of all equipment is included. Find your way to St Maarten's Kim Sha Beach to meet your guide and group. Get a short lesson on safety and paddling technique, then climb in to your 2-person, sit-on-top kayaks and paddle out into Simpson Bay. Watch the shoreline glide by and get an up-close view of the variety of marine vessels moored in Simpson Bay. With favorable weather conditions, you can follow your guide around Pelican Rocks and into the next bay. Move at a relaxed pace, with plenty of rest breaks to view the neighboring islands and birds at rest on the rocks. Reach your destination, a beach in a protected cove, and get fitted for snorkeling equipment. Listen to a short orientation, then follow your guide out to the coral reef and nearby rocky caverns. During 45 minutes of snorkeling, see tang, needle nose, trumpet fish, angel fish and parrot fish flitting about, as well as other marine creatures your guide points out. Paddle back to Kim Sha Beach in your kayak, then go ashore and have a drink at the Greenhouse Restaurant. Sit down with your group and discuss the marine life you saw and its importance to St Maarten's ecosystem. Please note: Single kayaks are reserved for guides or cases where there are an odd number of travelers. Please note: If weather conditions are not favorable for kayaking, you will participate in a beach swim instead. Tour was really great!!! Frank, was super friendly and always on the lookout for underwater wildlife for us to check out. It was a great combination of kayaking and snorkeling for an excellent value!!! Went with my 15 yr old son and 13 year old nephew who both really enjoyed it. Highly recommended! !